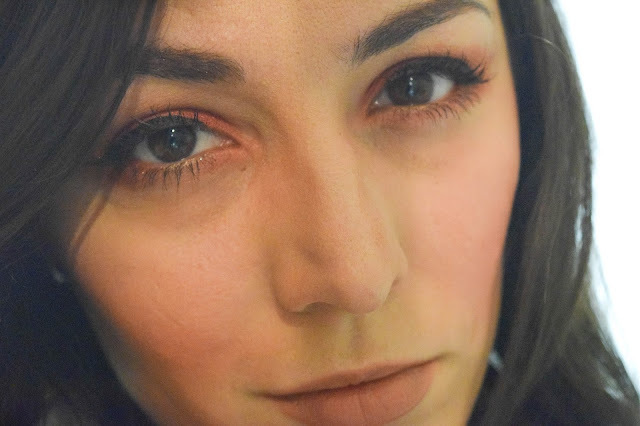 I recently decided that it was about time that I tried prescription contact lenses. 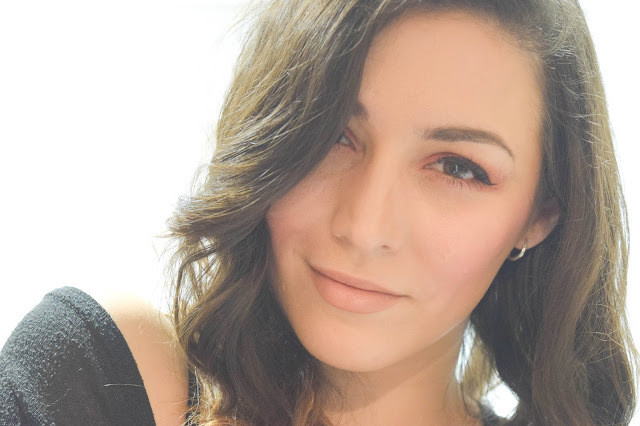 I know I can wear them as I've had contact lenses before but more for cosmetics and parties so when I had the opportunity to collaborate with ContactLenses.co.uk to review some of their latest daily lenses I jumped at the chance. 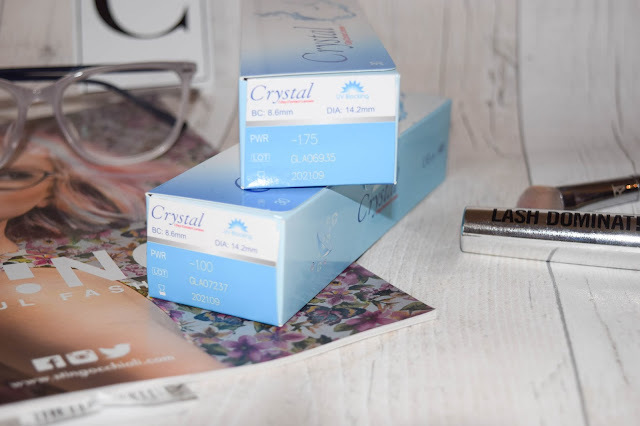 The lenses I'm reviewing today are these Crystal 1 Day Contact Lenses so if you're a lenses wearer or are interested in lenses in the future carry on reading to find out more about the service I received with the brand and the lenses themselves! So I received the lenses pretty quick after ordering them with the brand. They came within 3 days and unfortunately I wasn't at home so I picked them up at the post office the next day. The packaging was in great condition when it arrived and everything in the box was intact so I was really happy about that. Because I ordered through the brand for the opportunity to blog about it, the team set me up with my own account so that I can re-order the same thing in future! They sent me two boxes of the Crystal 1 Day Contact Lenses as my lenses prescription is different for each eye. Two boxes will last me a month if I use them everyday as there are 30 lenses in each box. Opening up the box the lenses are nice and neatly packaged and come in strips of individually packaged lenses. There is an easy to pull tab on the packets to make things much easier and the lenses come in a lens solution to keep them fresh. These are soft daily contact lenses so they are extremely flexible and very soft to the touch. I was a little worried about ripping them but with practise and care you can easily slip these out of the little packets and apply them without a problem. 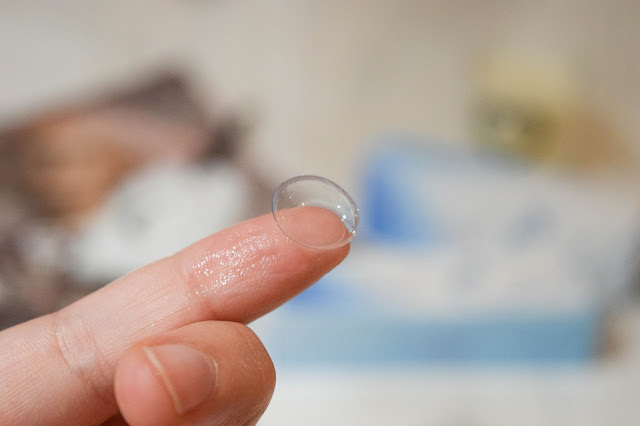 I learned a trick when I had my contact lens consultation a few months ago on how to check lenses are the right way and all you have to do is gently pinch the sides to see if they touch. If they do they're the right way around but if they're a little less flexible that way then they're probably the wrong way around. It's worth experimenting to find the right way. They work either way just the right way round they are more comfortable, you can feel the lens if they're the wrong way around. My first impression was a positive one. My prescription is perfect with these lenses and they're so comfortable that I'll often forget I'm wearing them! Inserting the lenses was a little tricky at first as they're a little bit bigger than my monthly ones but putting them in became easier and easier with practise. They're very soft to the touch and gently on the eyes too and what's best is that I haven't had any problems with them at all. They're also really hydrating as I've noticed my dry eyes have been less of a problem since I've started wearing them and I'm using eye drops less than usual. You can't see that they're in at all either and it's been a dream to be able to go out and not worry about glasses at all. Glasses get in the way when you want to wear non-prescription sunglasses, 3D glasses, you're doing anything active or when it's raining. It's a real pain to wear glasses when it's raining. Oh, and when you want to take a nice photo without the glare. 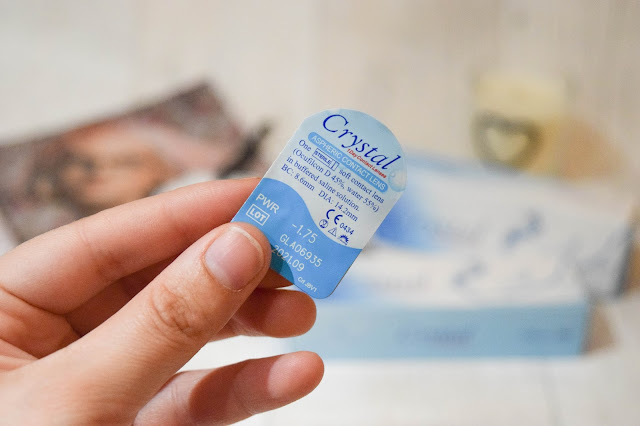 WOULD I RECOMMEND CONTACTLENSES.CO.UK AND CRYSTAL DAILY LENSES? In a short answer? Yes. Not only had the service been flawless, but the lenses arrived to me in safely and intact and it's been so useful and comfortable wearing lenses instead of glasses. A box of 30 Crystal 1 Day Contact Lenses costs £7.25 which for me right now, is a lot of money per month, especially since I'd have to buy two boxes. But that's only because I'm on my student budget right now and if I wasn't it wouldn't be an issue at all. It's also so useful and easy to be able to dispose of them instantly when I'm done with them rather than having to spend time safely storing them in solution and lenses case. 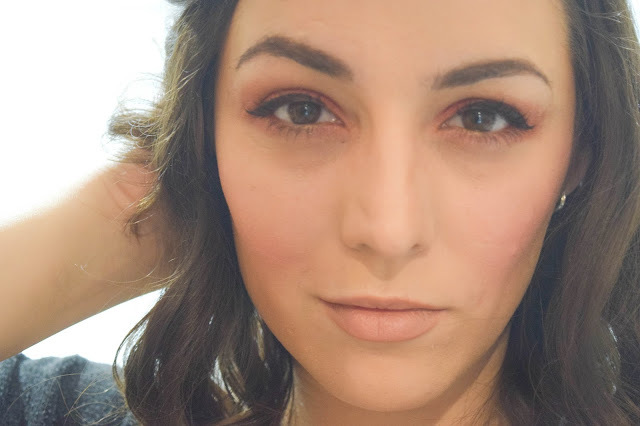 I'm rather convinced that I'll buy another two boxes when I'm close to out which is only about a week away but I'm also curious to try some monthlies from contactlenses.co.uk too as I'll probably wear those more often. After reading this review would you try Crystal daily lenses and shop at contactlenses.co.uk? It's awesome the fact you don't have to wear glasses all the time now, we can see your beautiful face!